Every time I actually have an OBE i almost Always raise some kind of vibration in my ears until I hear what you can call a binural beat and then im out. I read this article and thought why not try and listen between these signals Before i go to sleep. 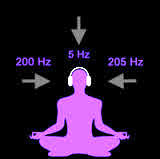 I Always hear these “frequencies” when Im awake if I want to and can increase them to a certain level oftenly. Before going to sleep I managed to increase this sound in both ears and listen “between” and hear this sound like when I get OB and I and my body was completely awake. Even though it felt like my non-physical body spun around when I Heard this sound. I thought this is Amazing maybe this is my method to get OBE easily and then I lost focus and it tuned down. I did the same later when waking up at night. It seems one has to find a balance between these sounds and focus to achieve this. Ill try this again coming Days, im really excited. Although it seems like once you loose ot for the time being it very hard to get these sounds/frequencies back for a while like you need to gather energy or something..? Louis, approximately how long does it take for the brain to have completed this physical change? And these new neural pathways, are they permanent or do they disappear over time? Hey Louis! Long time no see! Do this binaural beat work on earphones? A lot of people though recommend hearing this on headphones. Still, I’m still grinding for good headphones. But I got some good earphones though, but it might not give me the best results.